Voici une de mes premières découvertes grâce à Hype Machine (et le blog qui a posté le super cool "lift off cloud controler"). 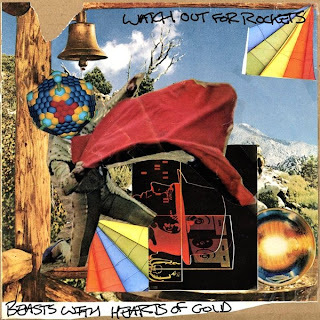 Watch Out For Rockets est une formation américaine de rock indé lo-fi (pour faire simple). Leur disque sorti numériquement en avril 2009 est un patchwork d'influences (punk, pop, folk, rock indé, lo-fi...), ça part dans tous les sens, mais globalement je trouve cet album prometteur et intrigant. Il y a d'excellents morceaux notamment erecting sun cranes et over mountains underneath the plow que j'ai choisi de vous faire écouter. Ajoutez les sur MS, Fcb, allez voir leur blog, ils sont très sympas (et talentueux). I disovered Watch Out For Rockets on Hype Machine, they were in the top, and the tune was really excellent ("lift off cloud controler"), so i need to say thanks to the blog who posted this very cool tune. Anyway, their LP was only digitally released in april 2009 wich is a shame because they are some winning tunes on it like the track mentionned above and the two tunes i have chosen (erecting sun cranes and over mountains underneath the plow), go to see their blog, MS, Fcb! An new Ep is soon to be released (in may).